December 10, 2012 marked the 64th annual International Human Rights Day (IHRD). Initiated by the United Nations in 1948, IHRD highlights those who have fallen victim to or survived human rights violations. In the US, the Filipino-American human rights organizations Committee for Human Rights in the Philippines (CHRP); with chapters in New York (NYCHRP), Portland (PCHRP), and San Francisco (SFCHRP); and Katarungan: Center for Peace, Justice, and Human Rights in the Philippines, culminated their 10 Days of Action with nationwide events for the Stop the Mining! Stop the Killings! Campaign. The Stop the Mining! Stop the Killings! Campaign condemns the October 18th slaying of Juvy Capion and her two sons by the 27th Infantry Battalion (IB) of the Armed Forces of the Philippines (AFP). Daguil Capion, Juvy Capion’s husband, had been targeted by the military for leading the B’laan tribe against the entry of Xstrata-SMI’s Tampakan mining project. Events on December 10th began when members of Katarungan Center for Peace, Justice and Human Rights in the Philippines delivered a petition signed by 350+ people in support of the Stop the Mining! Stop the Killings! Campaign, seeking justice for the slain Capion family, to the office of Ambassador Jose L. Cuisia, Jr. at the Philippine Embassy in Washington D.C.
That evening in New York, NYCHRP held its 2nd Annual Lights for Rights in NYC at Union Square Park. 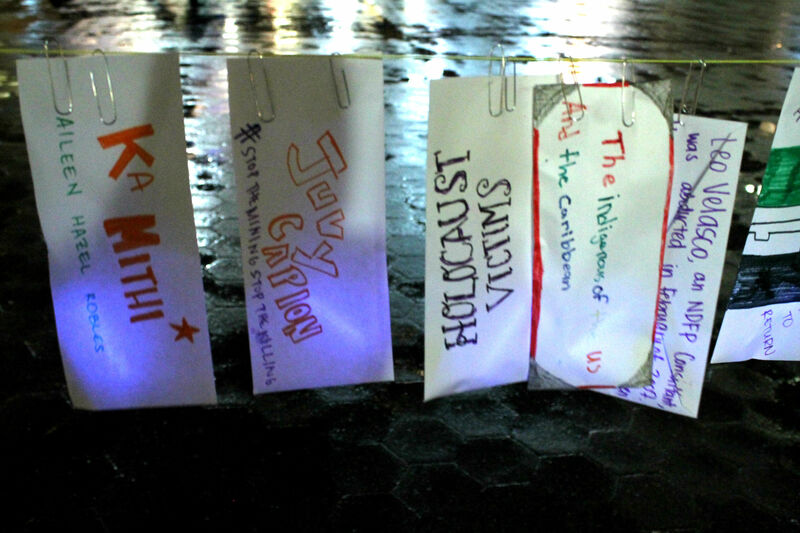 NYCHRP, along with members of other community organizations, exhibited an art installation of envelopes with names of international human right honorees, illuminated by glow sticks, to honor victims and survivors of human rights violations. “It is within the broad similarities between victims of state repression in the Philippines, Palestine by Israel, and the members of our own communities by the NYPD and FBI that brought us together to shed light on the atrocities that happen even on our own soil, despite our democratic system,” noted another NYCHRP member, Hanalei Ramos, when describing the variety of honorees being commemorated in the Lights for Rights art installation. Later that day in San Francisco, SFCHRP and local BAYAN-USA organizations babae SF, Anakbayan-USA and BAYAN-NorCal, gained audience with Deputy Consul General Jaime Ramon T. Ascalon at the Philippine Consulate. At this meeting, the organizations relayed to the Deputy Consul General the demands of the people; a letter from Erita Capion, sister-in-law to Juvy Capion; and the CHRP letter of demands regarding the Tampakan Massacre. “At no time did he seem to express the concern of millions of Filipinos and of the human rights delegation at his office over the plight of the Lumad peoples in Southern Mindanao over their displacement and harassment by AFP and by the plans of Xstrata-SMI to evict them from their ancestral homeland. At no time did he even offer any type of condolences for the AFP perpetrated massacre of the Capion family. It was as if our concerns, and the cries of the victims of political killings, were unheard,” said Rupert Estanislao, Chairperson of SFCHRP. While International Human Rights Day is commemorated but once a year, Filipino people remain fighting for justice daily. The Philippines’ most militarized regions are located in communities resisting aggressive foreign development, including large-scale mining corporations which have threatened the livelihood of hundreds of thousands of people through environmental destruction, displacement, and violent repression.The New York, Portland and San Francisco chapters of the Committee for Human Rights in the Philippines and the Katarungan Center for Peace, Justice and Human rights in the Philippines continue to condemn the Tampakan massacre and advocate for the rights and welfare of the Filipino people living in the Philippines, US and all over the world. JUSTICE FOR THE CAPION FAMILY AND ALL VICTIMS OF HUMAN RIGHTS! END ALL US MILITARY AID TO THE PHILIPPINES! FIGHT FOR NATIONAL DEMOCRACY & GENUINE INDEPENDENCE FOR THE PHILIPPINES! Next Post MON 4/29: Happy HR for Human Rights: A Mixer with Heart!